Since it is apple season it only makes sense that we incorporate them into every single meal. My kids will eat them in just about anything, so I’ve been working on using them for every meal. 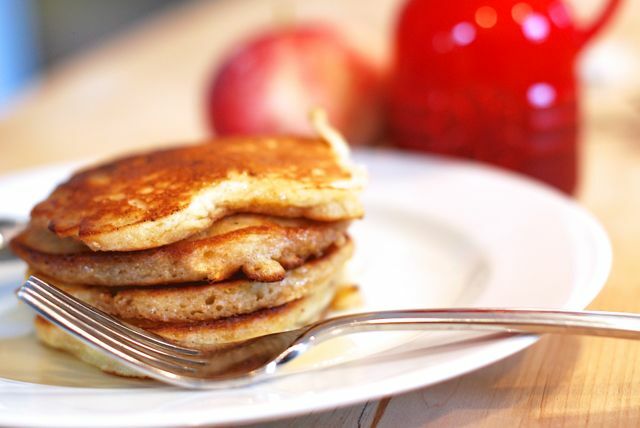 First up in the morning are these apple pie pancakes. They are fluffy and light with a lot of apple and cinnamon flavor. In fact, they taste so good it is kind of like eating apple pie for breakfast. Get a taste of fall and make use of the season's signature fruit in this easy breakfast dish. Step 1: In a large bowl mix the flour, sugars, baking powder, cinnamon, nutmeg, and salt. Step 2: In a measuring cup whisk the buttermilk, egg, and melted butter. Then stir it into the dry ingredients until completely smooth. Then fold in the grated apple. Step 3: Warm a large pat of butter in a non-stick skillet over medium heat and swirl it to coat the bottom of the pan. Dollop the batter onto the skillet in ¼ cup increments. Cook until bubbles begin to show on top of the batter. Then flip the pancakes and cook the other until golden brown. Continue cooking the pancakes like this, adding more butter to the pan as needed, until all the batter is used up. Serve warm with maple syrup!